Question: I am confused on the Yarn Over on the Rustic Potato Chip Scarf, when I bring the yarn forward and turn my work then slip the next stitch the yarn is in the back and it seems to not do anything then there is gap. 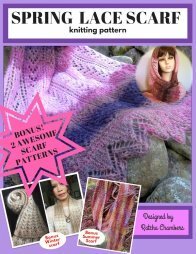 Can you explain the yarn forward and turning work and then slipping the next stitch. Do you have a video? on the Potato Chip scarf. Thank you for the question. The reason I used the wrapping method on my scarf because I ended up with bigger gap than when I didn't wrap it. I think this had to do with small yarn and big needle. Maybe you don't need to do the wrapping part at all. A few visitors mentioned to me that they didn't have to do any wrapping and their potato chip scarfs turned out just fine. 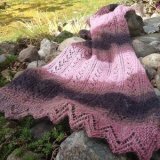 After I saw your question, I tried knit a few rows of the potato chips scarf using worsted weight yarn and size US # 7 needle. I knit one side with wrapping and one without. I don't see much differences between both sides. Maybe you don't need to do the yf part at all. Try it without using the pattern below and see if you like it. Row 2: K 8, turn work. Row 3: Sl 1, k to the end. Row 4: K 6, turn work. Row 5: Sl 1, k to the end. Row 6: K 4, turn work. Row 7: Sl 1, k to the end. Repeat row 1 to row 7 until almost run out of yarn. 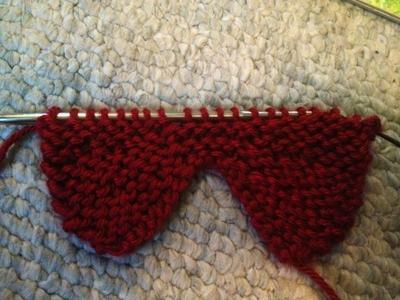 Bind off all stitches. I hope your scarf turns out well. I'm looking forward to hear and see the end result. Join in and write your own page! It's easy to do. How? 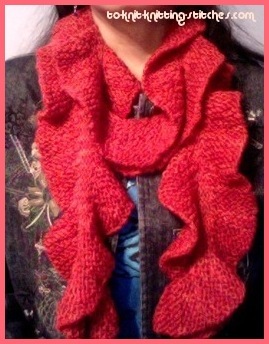 Simply click here to return to Rustic Potato Chip Scarf.